Technology companies are known for their unusual office furniture. Probably the best example is Google, whose workplaces are adorned with sleeping pods, bean bags, and slides. Mind Candy’s gorgeous London HQ looks like a fairytale forest, and AutoTrader has transformed a Volkswagen camper van into a meeting space. 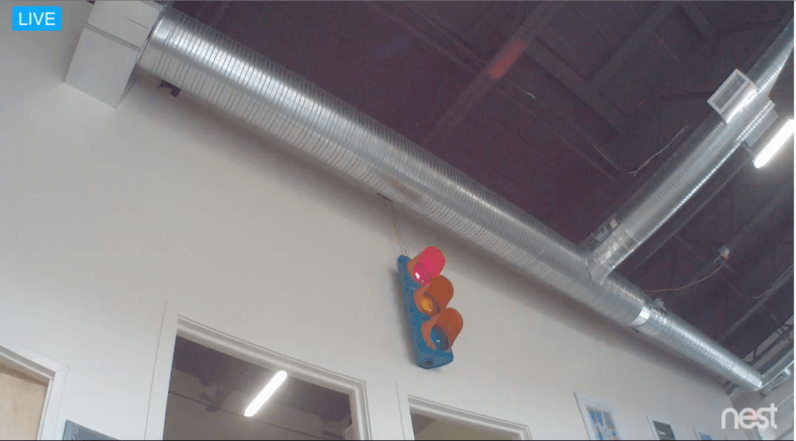 New England data science consultancy Arkatechture has its own quirky office installment, called the Arkalight. This is a traffic light controlled by a Raspberry Pi, and hooked up to a publicly accessible website. Anyone can visit this and get it to flash. Just press ‘r’ for red, ‘y’ for yellow, and ‘g’ for green. You can see it flash in real-time via a Nest cam. The traffic light used in this project wasn’t cobbled together by the developers. It’s the real deal, and once guided real-life cars. Where one finds a traffic light is beyond me, although Arkatechture is eager to stress that if you decide to create your own, you shouldn’t steal one from an intersection. The novelty of making a light flash in an office 4000 miles away has yet to wear off. If you want to play around with it, you can do so here.